UPDATE: this is fixed in jQuery 1.2.6 and later, see ticket #2709. …and various document.onready handlers not running. 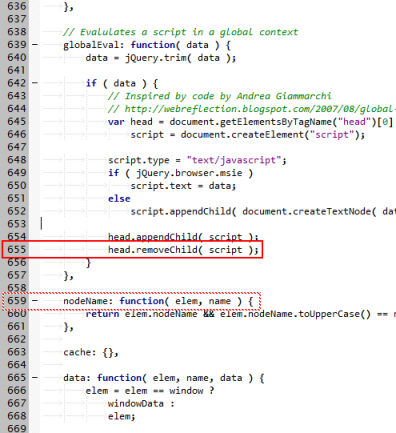 After whacking in a several alert()s in the lines in the vicinity of 659, it turns out the issue is with head.removeChild(script) in the globalEval function, 4 lines up. Obviously. alert(script.parentNode.tagName) // displays "BASE" !!! Update: Chris Venus comments about the reason for the weird behaviour in IE6 and earlier. Previously <base> was interpreted as a container, which could appear multiple times in a document: different sections within the page could have different bases, so would logically end up wrapped within each <base> (now there’s a feature everybody wanted, right?). Because of this, <head> got treated as a “section” of the document and elements added to it ended up as children of any <base> it contained rather than siblings. See IEBlog: All your <base> are belong to us. This post was a life saver for me. I was struggling with this for the entire day. And your post made all that worthwhile. Thanks a lot. I realised the other day a while after you said about this that the problem occurs probably because of the legacy of how IE originally implemented base. It used to be that base wasn’t an attribute that applied to the page. It was markup that applied to the section it was enclosing. That meant that you could apply a different base element to different parts of the page. That discusses it a bit more. Now *why* this caused the bug I don’t know but that must be why it was happening because it was trying to extend our base element to encompass a section rather than being standalone. Well jquery 1.2.3 also shows similar behaviour on IE6 and trust me i dont even use a base, i have tried alot of things but i still get the error. Thank you for posting this. You’ve allowed me to fix a long-standing bug with my Joomla powered website and IE6. Duncan, thanks so much for this. This bug is back in jQuery 1.3.2. And that’s when this line 12 error occurred.